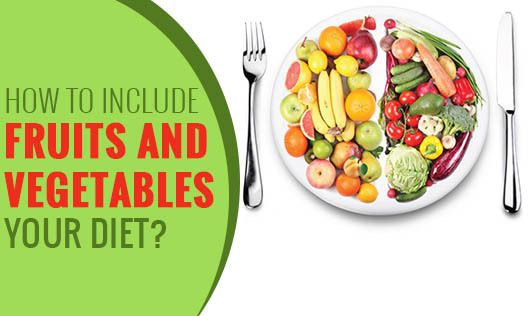 How to include fruits and vegetables in your diet? Fruits and vegetables improve our nutritional status and we require them more than any other food. They help us control various health issues like blood pressure, cholesterol, diabetes and are also good for our eyes and digestive system. But, even though we know fruits and vegetables are important, it's a trouble including them in our daily diet. So, here are a few tips for you to include fruits and vegetables easily in your diet. • Include fruits in your breakfast. Add it to your cereals, oatmeal or have it with your pancakes. • Make your own flavored yoghurt; add fresh fruits of your choice. • Replace your unhealthy evening snacks with raw vegetables or fruits. • Keep raisins, dates, carrot sticks etc in your office or car and have them when hungry. • Replace your cheesy, mayo snack dips with chunky fruit salsas. • Drink fresh fruit juices instead of tea, coffee or soda. • Planning to take a quick bite out? Opt sandwiches with vegetables and without mayo or cheese over burgers, pizzas etc. • Keep variety of colorful fruits in a bowl on the table. If you see them; you will end up having them. • Add vegetables of your choice to your chicken or egg soups. • Combine fruits with your salads and main course to not only give good nutrition but also a nice sweet, tangy, crunchy texture to your meals.